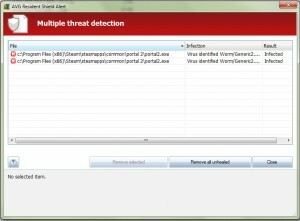 Either GLaDOS is messing with me, or I need to replace my antivirus software. After doing some digging, turns out that AVG is just reporting it as a false-positive. Nothing else on my system was infected, and this game wasn’t pirated, so there’s no way this could be a real threat. I’ve done just fine with AVG for quite a few years, but this really bugs me. Time to check out Avast! This entry was posted in Portal, Video Games, Virus and tagged avg, portal 2 virus on August 26, 2011 by David.